Naturally Lower LDL Levels Of Bad Cholesterol. There are many alternative treatments for lowering cholesterol, however before adding any alternative therapies to your diet, talk to your healthcare provider. There are a few natural products that are scientifically proven to reduce LDL (bad) cholesterol. Research shows that HDL (good) cholesterol reduces and recycles LDL cholesterol by transmitting it to the liver to reprocess, while cleaning the inner walls of the blood vessels. There are a few natural products have been proven in scientific studies to lower cholesterol. 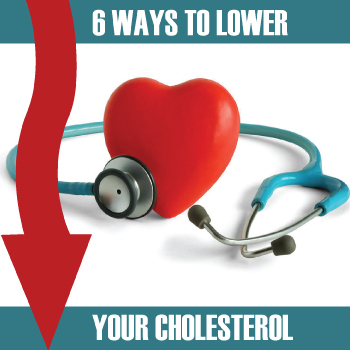 Naturally lower your bad cholesterol without taking medication. Limiting the amounts of dietary cholesterol, your intake is a good way to start lowering your LDL level. Trans- and saturated fats have been known to increase the levels of LDL cholesterol, some foods included in these bad fats are butter, fatty red meats, low-fat dairy items, and palm and coconut oil. There is one type of fat however, that research shows helps to lower LDL levels, omega-3 fatty acids. Some include salmon, sardines, herring, and trout. Always remember to use very-low-sodium or no sodium. Sometimes lowering the LDL level is as easy as just changing your breakfast to contain around two servings of oats a day. Studies show that eating more fiber rich foods have proven to lower cholesterol. Some significantly high fiber rich foods include brown rice, oats, oat bran, pinto beans, carrots, oranges, apples, okra and eggplant to name a few. By eating or taking plant sterols that are naturally rich in protein foods such as lentils, flax-seed, cashews, almonds, red and white beans, and soy beans are common legumes to include into your diet to lower LDL cholesterol levels. When consuming these protein-rich plant foods be mindful of how much you consume to avoid gaining weight. Studies show that consuming 1 to 2 grams of seeds and 1-ounce or 175 calories of raw, dry-roasted or unsalted varieties of nuts is enough to lower the LDL levels. Staying active is one of the best ways to keep the LDL cholesterol levels down and the HDL cholesterol levels up, such as a 30-minute walk, run or workout each day in the temperature-controlled climate. The benefits of regular exercise are incontrovertible. Studies show that physical activity will improve the ratio of HDLs to LDLs, decreasing your overall risk of heart disease and stroke. Plus, regular exercise helps control diabetes and high blood pressure, which are independent risk factors for heart disease. Dietary and herbal supplements are a last resort if you do not like to eat any of the above food mentioned. This is just an easier way of consuming these foods can lower your LDL cholesterol level and higher your HDL cholesterol level. There are many plant sterol supplements and psyllium supplements to choose from to get your LDL cholesterol levels lower and HDL cholesterol levels higher. When consuming alternative treatments to cut LDL levels, don’t forget about HDL cholesterol levels. Research shows that people who have a high level of HDL cholesterol have a lower risk of heart disease. The ideal LDL level for a human being is 100 or below, the lower LDL cholesterol level the better. This entry was posted in Health and Fitness and tagged alternative therapies, bad cholesterol, Cholesterol Level, good cholesterol, HDL level, LDL level, lower bad fats, omega-3 fatty acids, plant sterols, stay active, supplements. Bookmark the permalink. Very illustrated guide to lower cholesterol it will be handy to try these. Please reply back with your results. We are very interested to always here from our audience. Good luck to you! We are happy to help! Check back soon for some more helpful health tips and more. Thank you Wind, please keep checking back for more to soon be posted. Please consult your family physician before using any methods listed above. All information can be credited to the American Heart Association. Thank you! An amazing discussion is unquestionably worth comment. Thank you all! Have a beautiful day! along with the remaining portion of the website is really good. Thank you, your comments and kind gestures are appreciated! Keep checking back for more. I truly wanted to compose a small comment so as to thank you for all the great techniques you are writing on this website. My incredibly long internet lookup has at the end been compensated with good quality tips to go over with my close friends. I ‘d declare that many of us site visitors actually are quite fortunate to be in a really good site with very many outstanding prnslsfiooaes with insightful points. I feel extremely grateful to have seen the web site and look forward to some more pleasurable minutes reading here. Thanks again for everything.